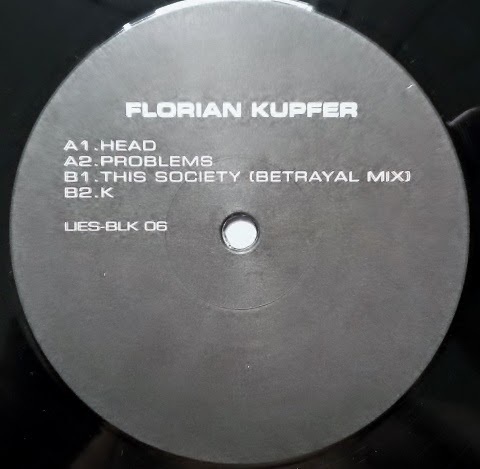 Musically, Florian Kupfer has experienced a lot in his young life. At eight he joined children’s church choir with rehearsals six times a week, he told in an interview for De:Bug. However it did not last forever when the fellow from Wiesbaden turned to hip hop in his teens, to fall under the spell of drum machines thereafter. After a successful promo to Ron Morelli via Soundcloud, Kupfer has become a L.I.E.S. regular and with “Head” he delivers four shots of rebel house for the label’s black series. Deformed synth chords introduce the bass-crazy title “Head” where the alarm clock and bells provide much more efficient mental cure than seeing a shrink. “Problems” follows the suit of post-Chicago modulations, served with claps, hi-hats and freaky Hammond heard in Hieroglyphic Being’s “Cosmic Bebop“. Compared to the previous, “This Society (Betrayal Mix)” dwells in almost laid back spheres when sultry chords are arching over bleeps and scarred textures. For the end distorted and dissonant stomper “K” fires with exclamations by a robotic hard rhymer close to “Dominator”. If undecided which one to pick from L.I.E.S. ever-expanding catalogue, this is the one for jacking in a deserted warehouse.